The famed pine trees on the Isle of Pines, New Caledonia. Locals confidently claim that the Isle of Pines is ‘the perfect place’… so naturally IT must investigate. Words and photography by Zoë Morley. The Isle of Pines is a place to unwind. Here nobody rushes. The clocks run by island time. The bellies bulge from French-style cooking. You won’t see many swaying coconut trees; instead strikingly tall pines blanket the island from tip to toe giving the impression of giant skeletal fingers reaching upwards towards the heavens. 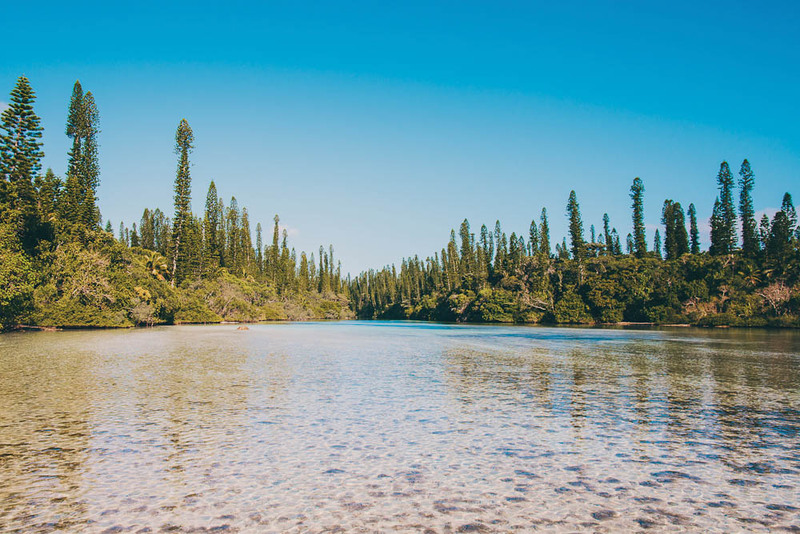 The French connections and beauty of the Isle of Pines have made this New Caledonian island a heavenly honeymoon hideaway and stopover for cruise lovers. 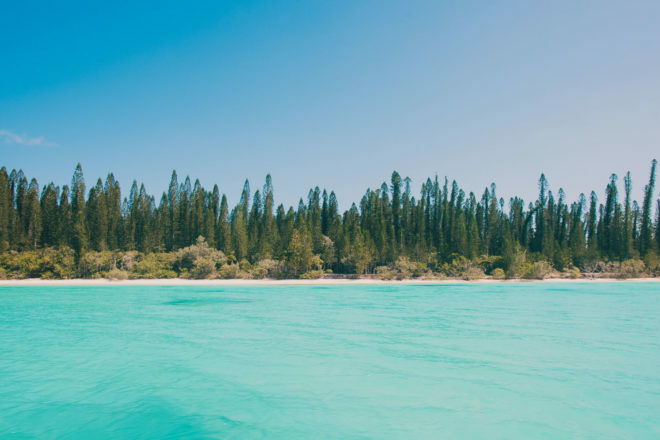 Although French is the official language, New Caledonia is the France of the South Pacific – only 2.5 hours by plane from Sydney; half the distance of a flight to Perth. It’s a place where you can walk down the street with a baguette in one hand and a coconut in the other. Captain Cook first spotted New Caledonia’s conifer coated isle in 1774 and named it after the pines endemic to the island. Today, there are few hotel developments on the 10-kilometre-wide island and it is free of the usual tourist traps and commercialism (no McDonald’s in sight, hurrah). As such, the island still feels likes its original, blissful, unadorned self. Upon my arrival to the Isle of Pines, I meet local guide David who is one laid-back, cheerful chap. The island pace obviously suits him. As he drives me around I notice that each time we pass someone, he toots his horn and waves or chuckles to himself. He tells me that it was his cousin who just rode past and before that his uncle. “I know everyone who lives on the island – all 2500; mostly Kounies, as the locals are known. If you are a Frenchie and you move here, the next day I will know you.” He tells me all this as he waves wildly out the window to another passerby. Looking out onto vast crystal blue lagoon of Upi Bay stretching out before me, there is hardly a soul to be seen. It’s hard to believe that a place like this is only a few hours from home. Another mesmerising spot is the Bay of Kanumera, which juts out from the south-western side of the island. Just a hop, skip and jump across from here is Kuto Bay; just the spot to relax, snorkel and wander about aimlessly. All in all, a perfect place. For lunch David presents me with the local traditional dish of bougna – a mix of yams, melon, bananas, chicken, large cloves of garlic and coconut milk, all wrapped in banana leaves and cooked in an open fire. It’s probably not my favourite meal of the day, with the potent garlic and banana infusion confusing my tastebuds. But David is extremely proud of the meal his family has prepared for me and offers me ‘fourths’ (I felt too bad to say no to all the other rounds). I am all garlic-banana-ed out and have to roll off my chair. As I sit digesting my meal, a little lady emerges from the forest carrying a large hessian bag. David introduces her to me as Michelle, his mother. She can only speak French and Kounie, but she still makes it clear to me that she holds a prized possession in her bag. Without warning, she tips out its entire contents at my feet – suddenly there are about 100 huge forest snails making a slow run for it. Just like in France, eating snails here is a local delicacy over which everyone seems to go crazy. Michelle has harvested the snails and is en-route to the local hotels and restaurants to sell her crop. These snails are endemic to the Isle of Pines and cannot be sold internationally or even to mainland New Caledonia. Michelle picks up a large one and pretends to put it in her mouth with a sly giggle, asking if I would like one. No thanks – I don’t feel like adding snails to my banana-garlic stomach contents. What makes this place such a great getaway is the tiny uninhabited islets that are encircled by a large turquoise lagoon. The next day I decide to explore these remote little islets. Alongside a few other tourists I am dropped off at Nokanhui islet, which is a tiny sandbank with a few low-lying trees and shrubbery. It’s beyond picturesque. Here it is easy to forget about everything and just revel in the serenity and isolation of this tiny uninhabited patch. Eating a fresh seafood lunch and enjoying the tranquil surroundings, I return to thinking about what David said. I think he had it right – it is a perfect place. Qantas and Aircalin codeshare and run daily flights from Sydney and thrice weekly from Brisbane to Noumea, New Caledonia’s capital. Flights average at about $850 return depending on the season. From Noumea take a 20-minute flight from Magenta domestic airport (50 kilometres from the international terminal) to the Isle of Pines. Flights are from $190 return. Buses are available between the international and domestic airport. The island is relatively small so travelling from one side of the island to the other takes no time at all. The roads are good and, with only one petrol station on the whole island, there isn’t much traffic. Hiring a car is a good idea; almost every road either leads home or to a beautiful beach. And with the independence you can avoid any crowds and find your own private sanctuary. Horse riding – there is a ranch in Gadji run by the locals and trips (from two hours to full-day) can be organised from your hotel. If history is your thing, there are amazing ruins scattered around the island. In 1871 almost 3000 Parisian rebels were deported to the Isle of Pines and imprisoned; the surrounding area was turned into a penal settlement where the convicts lived for about 30 years. If you have the time, a short walk through the rainforest to Queen Hortense’s cave is a worthwhile trip. Apparently in 1855 the Queen had to hide out in the cave for a year in fear of her life. The amazing hanging stalactites and fern-covered limestone rock face makes you feel as though you are visiting a prehistoric location fit for a dinosaur documentary. The French influences and surrounding pine trees make you feel worlds away yet it’s quicker to get to than Bali and Thailand – and offers a completely different holiday experience. Be aware that the Isle of Pines is a frequented stopover for cruise ships. Obviously it’s best to visit when the ships are not docked at Kuto Bay, or else fear the onslaught of hundreds of passengers. The cruise ship stopovers are seasonal and if you time it right, you can avoid them. Although the island boasts mostly pleasant weather all year round, a tropical depression occurs from the months from December to April. As it’s situated further south, it luckily avoids most of the unwanted heavy rain, winds, stormy seas and cyclones that the mainland receives, but on occasion it gets hit and you don’t want to be there if it does! a great review of ile de pins, we hope to arrive on a holland america ship on mar. 13 and would love to engage david for a tour of the island. can you put us in touch w/ him. many thanks and keep up the great work. Absolutely love the Isle of Pines too. Nataiwatch is really a great accommodation, in one of the most beautiful bays of the island. I’ve started a blog about New Caledonia if you’d like to have a look too: mynewcaledonia.co . Happy travelling to all! What’s cooking in New Caledonia?